I knew when I saw my hand shaking while giving my passport to the woman at the check in counter that my time abroad was going to change my life forever. I had already visited England in 2001, but that was with my family. This time I was going by myself. I would have one layover and then when I arrived in London I would have to figure out the train system. I had never taken a train except at Disneyland. What was I supposed to do? These were just a few of the worries I had before I hugged my family and said my good-byes. Of course I would have more on the plane, but first, I had to take that step and cross the threshold into the unknown. I had to start study abroad. Before I even left to study at the University of Exeter I had a major problem—I didn’t have a housing arrangement. I had filled out the online forms and chosen the residence I wanted to stay in, but I remembered that I wasn’t supposed to pay the housing deposit. However, there was a change in policies and I could not get a room assignment without that housing deposit. For two days I was calling DU and the UK to figure out this problem. Thankfully with some last minute paperwork sent to Exeter I was able to get a room, but I would not know where I was living until I arrived. After a string of good luck during my travels I arrived at the University of Exeter. Yes, I figured out the trains and yes, when I checked in at housing I did have a room. I was in Lafrowda E212. This room assignment would change my life forever. I didn’t travel much during my time at Exeter. I did one weekend trip to London and one weekend trip to Paris, but for the most part I explored the area around me. I know that is very different than most other students, but I really didn’t want to leave. I had the most amazing friends and the best part? Almost all of them were my flat mates in E2. I would go out all the time to Arena (the student night club), have kitchen parties in the flat, and just explore the towns nearby. The funny part is that most of these students were international, and most of them didn’t speak English as a first language. Of course, I made plenty of English friends, but there was one person who really had a huge impact on my stay, a certain French boy living in E200. I met Thomas on my second day in Exeter. I was a little blue sitting at the table eating lunch because I couldn’t get a hold of my parents and I thought it was weird that I was completely surrounded by French people, my other flat mates. Then this guy walks into the kitchen. My first thought was, “He’s cute.” And then he started to speak French, so I thought, “Shoot.” I had taken French in high school and at DU, but I didn’t want to study abroad in France so I thought this was the French department’s way of punishing me. However, over the next three weeks I got to know the French speakers, especially the boy from Paris, and my appreciation of francophone culture went up. We had other nationalities in the flat: German, Swiss, Spanish and Australian. However, the Frenchies were in the majority so everywhere you went you heard French. I served as translator from time to time, but even I couldn’t understand everything. Still, it gave me a chance to hang out with Thomas and we became closer. After a few weeks it kind of became official: we were a couple. While, I know I said I didn’t want to travel because I wanted to spend time with all of my international friends, I can’t lie and say that it wasn’t also because of the French boyfriend. However, I got so much more out of my study abroad experience because I developed these relationships. When I had to leave I was so devastated to say good-bye to this group of people who were really my family. Everyone cried at my farewell party and they told me after I left it didn’t feel the same. And to be honest, I didn’t feel the same. I felt like my true life was there and I was determined that I wouldn’t lose touch with my international family. I still keep in contact with these people and I have visited some of them. The best part is I know that I have so many places to visit and so many people to see because I have lifelong friends all over the globe. When I say study abroad changed my life I really do mean it. I wouldn’t be typing this blog post in Paris where I’m now a graduate student earning my M.A. in History at the Université de Paris 1 Pantheon-Sorbonne and living with Thomas after four and half years together if it hadn’t. I understand if you might want to travel during your time abroad, and that’s perfectly fine. But let me give you some advice: don’t think this is the only time you’ll be abroad. You will get a taste of what it’s like and you’ll want to do it again. I’m not the only one from DU living life as an expat. You will learn that you are a citizen of the world and you can make any opportunity possible if you put your mind to it. Get to know your fellow students and the place where you’ll be living. I promise you’ll never regret it. And who knows? Maybe you’ll meet the love of your life. I know I did. Previous WANT TO SHARE YOUR STUDY ABROAD EXPERIENCE? MAKE A DIGITAL STORY! Next GOING ABROAD—HOW TO NOT FRY YOUR ELECTRONICS! Ahh! This post gave me the chills. How absolutely lovely. I have to agree with you, during my six week period of time in London doing study abroad through FSU, I also liked to explore my surroundings a lot of the time. (Granted I’d been on a trip to Europe before with my family as well,) but other than a weekend trip to Scotland, I spent most of my weekends going to the smaller cities around us and such. That is so awesome that you and Thomas are still together, and that you live abroad now. 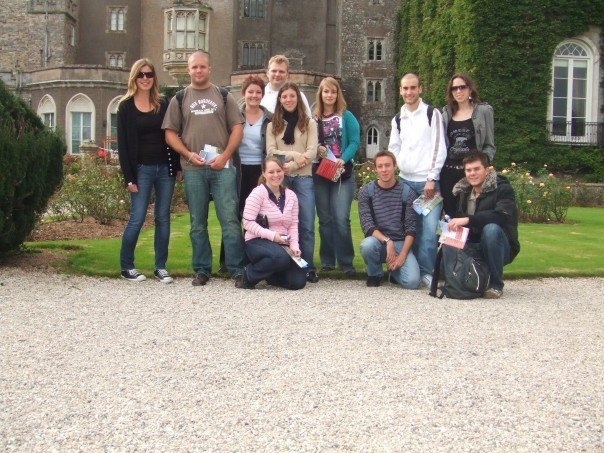 My summer session was in 2008 and I am just itching to get back across the pond. Very cool. I can see how studying abroad can change your life and make it more exciting. I’m trying to get into a situation to work/live abroad. If this happens, then studying abroad will be a must. Best of luck!